Top higher education programs to be disseminated to 20 Abu Dhabi schools. Abu Dhabi’s education authorities affirm the need to overcome an existing gap between the output of the emirate’s education system and the needs of the labor market. The Abu Dhabi Executive Council is taking concrete steps to innovate the learning experience and deploy competent educators. To supplement these ongoing efforts, ALHOSN University has begun a series of ‘Open Day’ visits to high schools across Abu Dhabi to enlighten students on the best career choices and current labor market demands. The university has already toured 15 schools so far, with plans to visit five more institutions. In each visit, university representatives outlined career paths for in-demand fields such as Engineering, Architecture, Education and Business Administration, all of which are covered by ALHOSN’s academic programs developed primarily by North American educators. They noted the employment benefits of enrolling in the Bachelor of Science in Mechanical Engineering (BSME) course which was launched just last year. Students were also encouraged to avail of scholarships of as much as 90 per cent and above as well as various internal training, internship, recruiting, sponsorship and assistantship programs. To assure prospective students of its high academic standards, ALHOSN also highlighted its recent achievement as the first private university in Abu Dhabi to receive accreditation from the US-based Accreditation Board for Engineering and Technology, Inc. (ABET) for its Bachelor of Science degree programs in Civil Engineering, Industrial Engineering, and Software Engineering. ALHOSN is currently the only university in the UAE that is ABET-accredited for its Industrial and Software Engineering programs. “Effective and timely education is a pillar under Abu Dhabi’s ambitious Vision 2030 development blueprint. Local authorities are currently focused on ensuring that the right learning output is achieved to meet current labor market needs. We are helping the cause by visiting high school students across the emirate and emphasizing the importance of choosing courses that fit their professional and even personal goals with current job market requirements in mind. The response has been very positive and we look forward to seeing many of the students we have interacted joining our community and benefitting from our philosophy of ‘global knowledge with local vision’,” said Prof. Raymond Tennant, Provost and Acting Vice Chancellor, ALHOSN University. Abu Dhabi-based ALHOSN University is a private educational institution dedicated to ‘global knowledge with a local vision.’ It was founded in 2005 by the Abu Dhabi Holding Company in response to growing local demand for high-quality, value-based educational institutions. It currently offers 12 undergraduate and 7 graduate programs under the Faculties of Engineering and Applied Sciences, Business, and Arts and Social Sciences. ALHOSN accepts students of all nationalities and also accommodates youths with special needs. All its programs are accredited by the UAE Ministry of Higher Education and Scientific Research. ALHOSN University to debut in prestigious Tamaiaz & Falak Tayyeb Award. ALHOSN University has confirmed its first-ever participation in the Tamaiaz & Falak Tayyeb Award, an excellence-driven competition open to Emirati university seniors and fresh graduates. The university joins an elite group of 11 public and private universities to promote innovation, creativity and competitiveness among young UAE Nationals. ALHOSN is the only private university based in Abu Dhabi to take part in the award. Currently in its 6th edition, the Tamaiaz & Falak Tayyeb Award – which translates as ‘be distinguished and your dreams will be fulfilled’ – is an annual contest that honors top-notch research works and projects made by aspiring Emiratis aged 25 years and below. ALHOSN University recently received visiting award representatives who delivered a presentation on the application guidelines and selection criteria. Students were encouraged to develop projects and studies under the award’s seven major categories: Marketing, Communications and Media; Leadership and Management; Accounting, Banking and Finance; Society and the Environment; Science, Technology and Inventions; Entrepreneurship; and Design, Photography and Film. “We follow a university motto of fostering ‘global knowledge with local vision,’ which the Tamaiaz & Falak Tayyeb Award fully complements. By inculcating creativity and excellence among young Emiratis, we build up the skills they need to achieve professional success while reinforcing their participation in national development. We take great pride in the works to be showcased by our students, especially as we are joining for the first time and are the sole representative of Abu Dhabi’s private higher education sector,” said Prof. Raymond Tennant, Provost and Acting Vice Chancellor, ALHOSN University. The Tamaiaz & Falak Tayyeb Award was launched in late 2007 with the objectives of supporting Emiratization in the private sector, encouraging creativity and excellence among young UAE Nationals, and providing job opportunities for outstanding contestants. The 2013 edition is currently accepting individual and group entries until May 12, 2013. This year’s event will be held under the patronage of Sheikh Maktoum Bin Mohammed Bin Rashid Al Maktoum, the Deputy Ruler of Dubai. More details are available at http://www.tamaiaz.ae. ALHOSN Universitywas established in 2005 by the Abu Dhabi Holding Company in response to growing demand for high-quality educational institutions in the UAE. It currently offers 12 undergraduate and 7 graduate programs under the Faculty of Engineering and Applied Sciences, the Faculty of Business, and the Faculty of Arts and Social Sciences. ALHOSN caters to students of all nationalities and those with special needs. Affirming an institutional commitment to the philosophy of ‘global knowledge with local vision,’ the Management Information Systems (MIS) Department at ALHOSN University, a leading Abu Dhabi-based university dedicated to high-quality, value-based education, sent nine of its students (a male and 8 females) on a once-in-a-lifetime 10-day trip to Seattle, USA, to learn about America’s educational and industrial practices. Encouraged by University Vice Chancellor, the trip was meticulously prepared six months in advance by Dr. Fadia Hegazy, Associate Professor and Chair of the MIS Department,and Dr. Kamel Ghorab, Professor of MIS and strategic Management, who served as chaperons to the lucky participants. The tour included a two-day visit to the offices of software giant Microsoft, where students participated in a series of workshops on Microsoft’s Program, Cloud Computing and Source Control at social networking service company Facebook. The delegates also paid a formal visit to Microsoft’s Visitors Center and Company Store where they learned about the evolution of the personal computer and its software applications. Another highlight was the visit to the Future of Flight Aviation Center and Boeing Company. The students took a 4-hour tour of Boeing’s production plant in Everett, Washington, where they witnessed the preparation of 747, 767, 777 and 787 jets prior to assembly. They were exposed to various management systems, concepts and techniques such as Just-In-Time, Production Smoothing, In-Process Product Inventory Management, and Management by Objectives, among many others. The young delegates also got the chance to visit Costco superstore, the famous wholesale club, where they learned about the company’s unique marketing model. Costco’s practices have been covered by many Strategic, Marketing and Business Management textbooks. A quick visit to Google was also scheduled. To satisfy the academic curiosity of the delegates, ALHOSN’s MIS Department also arranged for a visit to the University of Washington (UW), one of the world’s leading research universities. Members of UW’s Information College noted how the quality content and goals of ALHOSN’s academic programs were comparable to their own. Many of the visiting delegates voiced their interest to join UW for their future pursuit of a Doctoral Degree in MIS. “Fun and learning typically do not mix, but at ALHOSN we follow a holistic approach to personal and professional development. While of course we wanted to expose our students to some of the best educational and industry practices in the US, we also included elements of fun into their trip. This balancing of work, play and socialization is something that we hope our students will bring with them as productive members of their respective communities. We intend to continue preparing impressionable activities such as this US trip to bring about future leaders who are aware of the world, their selves, and their relevance to society,” said Prof. Ghorab. 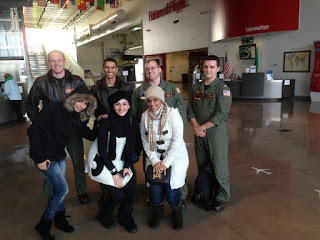 “Our trip to the US was a wonderful experience that taught us that the more we learn and acquire practical skills, the more opportunities we get to be recognized not only nationally, but internationally as well. The visit showed us that learning does not end in the classroom, but is rather a continuous process of development depending on how you embrace creativity and innovation,” said Aref Al Hammadi , a student participant. Among the fun activities included in the delegates’ calendar were a sightseeing tour of Seattle, a cruise of Lake Washington, meals at The Cheese Cake Factory and Olive Gardens Italian Restaurant, and stopovers at the Southern Mall Center and The Square. Tour organizers were impressed by the discipline, respect and appreciation shown by the students. The UAE Ministry of Education (MOE) recently presented Dubai Quality Group (DQG), a non-profit organization that advances learning, promotes quality improvement and Business Excellence practices, the ‘Knights of Communication Award’, which recognizes strategic partners, collaborators and innovators that contributed to the Ministry’s ongoing development initiatives. 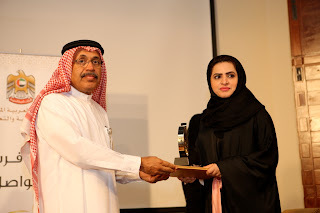 Badriya Al Tamimi, Managing Director of DQG, received the award on behalf of DQG from H.E. Ali Mehad Al Suwaidi, Acting Undersecretary of the Ministry of Education, during a ceremony attended by H.E. Marwan Ahmad Al Sawaleh, Assistant Undersecretary for the Supporting Services, and department directors from the Ministry and educational districts. The Ministry of Education has benefited from the support extended by DQG and other strategic partners in its continuing efforts to further enhance the standards of excellence in the delivery of education across the UAE. Moreover, DQG had previously signed a memorandum of agreement with MOE to collaborate in various quality-related projects. Dubai Quality Group is non-profit business organization set up by the Dubai Department of Economic Development under the patronage of H.H. Sheikh Ahmed bin Saeed Al Maktoum. Guided by the vision of H.H. Sheikh Mohammed bin Rashid Al Maktoum, Vice President and Prime Minister of the UAE and Ruler of Dubai, Dubai Quality Group was established in 1993 to develop and promote Quality and Business Excellences practices in UAE. Khalifa University Abu Dhabi – video 41st UAE National Day celebration. Special moments from the 41st UAE National Day Ceremony that was held atCampus in November 28th, 2012.